TOP OF FIRST HOUR NEWS: Fri., Mar. 29, 2019 – Church on Sunday 11am PT at BOND in Los Angeles (doors open 10:30), streaming at 11PT (1CT/2ET) rebuildingtheman.com/church Subscribe to BOND: Rebuilding the Man (we put out a new old BOND Sunday Service from May 2008, it’s great, check it out on our BOND: Rebuilding the Man YouTube channel). NOTE: I understand UK observes Daylight time THIS Sunday, Mar. 31st. Amazing. We jumped ahead a few weeks before you did. Interesting. How about this cover-up? (Drudge) Border Patrol orders quick releases of families… (AP) The number of migrant families and children entering the U.S. from Mexico is so high that Border Patrol is immediately releasing them instead of transferring them to the agency responsible for their release, forcing local governments to help coordinate their housing, meals and travel. Agents are still doing medical screenings and criminal checks, but they’re no longer going through U.S. Customs and Immigration Enforcement?? (they mean ICE — AP got it backwards here), which manages their deportation cases. Various sectors are releasing so-called “families” on their own recognizance, typically with notices to appear in immigration court due to legal restrictions on detaining them and lack of holding space. Border arrests have skyrocketed in recent months — agents on track to make 100,000 arrests and denials of entry this month, over half of which are so-called families with so-called children. 'Mother of all caravans' pushes north… (AP) Mexico braces for new caravan of Central American migrants. Interior Secretary Olga Sanchez Cordero says “a new caravan is forming in Honduras, that they’re calling ‘the mother of all caravans,’ and they are thinking it could have more than 20,000 people,” including so-called migrants from El Salvador, Honduras and Guatemala. There is question whether it’s that big; a WhatsApp group for it only has 206 members. Past caravans hit very serious logistical hurdles at 7,000-strong. A caravan of about 2,500 Central Americans and Cubans is already coming up through Mexico. Jesse Lee Peterson Teespring shirt says: “OH, THE WALL GOIN’ UP!” with Jesse Lee Peterson’s name below, available in white ink on a dark colored / black shirt — also available in black ink on a light colored / white shirt, as well as various other apparel items, tote bags, and mugs. Thanks, guys! White people let people of color into their country — the greatest country in the world. Jesse talks about Ilhan Omar calling us a white supremacist country for letting illegals stay under a parking structure or bridge. Jesse talks to callers: Why are whites allowing these people into the country, even changing our languages. And they’re blaming Jews — others for their problems. (Drudge & Breitbart) USA Projected to Add 1.5 Million Illegal Aliens This Year… if current rates of Catch and Release, border crossings, and visa overstays continue. I mentioned before — Princeton Policy Advisors researcher Steven Kopits projects that in 2019, there will be up to 500,000 illegal aliens at the southern border who successfully cross into the U.S. undetected by Border Patrol agents. Also Church on Sunday, 11am PT (1CT/2ET), doors open 10:30 in Los Angeles. RebuildingtheMan.com/church Subscribe BOND: Rebuilding the Man on YouTube, Like our page on FB, follow Jesse on Periscope and DLive.tv/jesseleepeterson — shout out! A black rapper is no Darius Rucker of Hootie and the Blowfish. Billboard removed his song from their country charts. Trump speaks at Michigan rally in Grand Rapids. Caller Earl thinks White History month is all 12 months of the year. Another caller Ron answers Biblical Question: What is a white supremacist? He says blacks are hostages in America. He calls Jesse a “biscuit.” He’s in his 50s, and black. (Drudge) Only black reporters allowed in GA mayoral race event… (Online Athens) Photos taken Wednesday night show 8 ½ x 11 printed paper signs on the doors of Bolton Street Baptist Church during a meeting to garner support for a Savannah, GA, mayor’s race, saying “NO media (TV, radio, etc.) Black Press Only!” So white reporters were barred from entry, while black reporters for at least two television stations were permitted inside. The event was coordinated by the Rev. Clarence Teddy Williams, owner of the consulting firm, The Trigon Group. Former Savannah Mayor Edna Jackson declined to comment before going inside, as did Chatham County Commissioner Chester Ellis, who said, “This was not my idea.” All kinds of black reporters and journalists went inside and refused to speak up against it. (Google) Over 55% of Savannah's population is black. Just over 38% is White, 2% is Asian, 2.01% is Mixed. Hispanic and Latino inhabitants make up over 4% of the population. I mentioned yesterday the black female Chicago prosecutor Kim Foxx defended the decision to drop charges… even though they thought the police told the truth that Smollett lied. They think community service and a fine is enough. But Chicago officials want him to pay $130M. 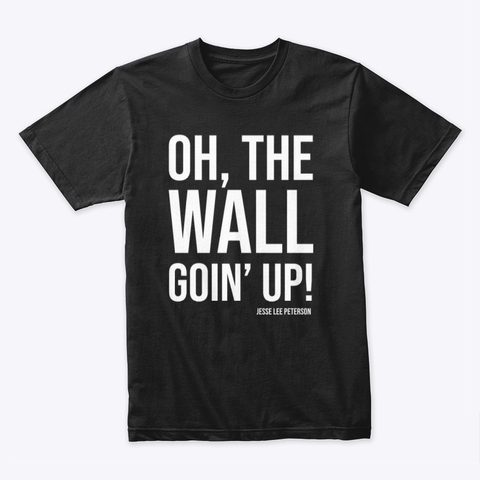 “Oh, The Wall Goin’ Up” t-shirts (black ink or white ink) available go to Teespring.com/stores/jesseleepeterson also “Not All, Not All, Not All, But Most,” “The Great White Hope,” “That’s Amazin’,” and others. You can also find by going to JesseLeePeterson.com and scroll down to find the T-shirts for sale ad. Check out The Jesse Peterson Show (1990s TV) on Jesse Lee Peterson YouTube channel. Kevin of IL talks to Jesse: Will AOC, Rashida, and Ilhan be re-elected? Francisco of Rhode Island, 1st-timer, is 18. He asks how to deal with being racially profiled. Overcome your mothers, forgive them, and return to your fathers. He asks about Farrakhan — he’s an evil man, full of hate. Black people don’t need leaders. He asked if blacks returned to their proper state, would they be superior to white people? No human being is superior to another, period. He tells his friends common sense like Obama didn’t do anything good. He loses some friends. Stay on the right path. Jesse talks a little more after Francisco’s call. James reads Super Chats. Joel asks about an “oopsie moment” and if using Plan B is an abortion. A caller asks Jesse about marriage by the law of the land vs. just living together. More callers talk to Jesse — good calls!